This article explains how to connect to your FDM printers in GrabCAD Print. If you have a J750 or Objet 1000, be sure to read how to Set up your PolyJet printers for GrabCAD Print. 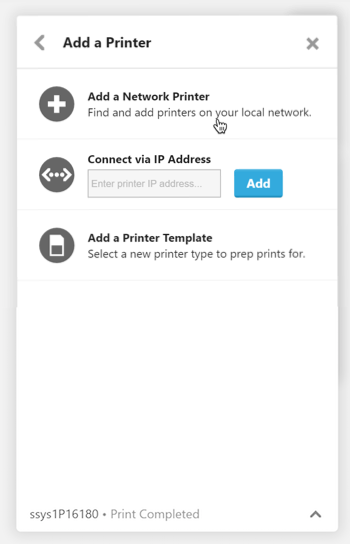 Click "Add a network printer"
If you have more printers, repeat the above steps as needed. 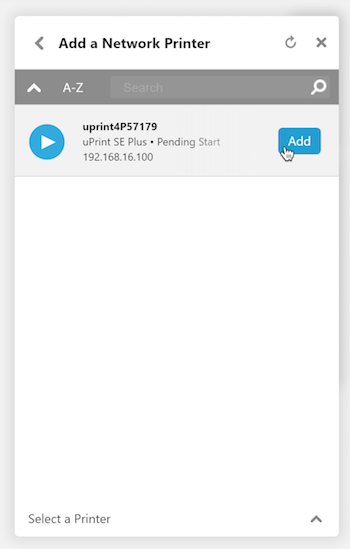 There is a hardware setting on the printer to disable network discoverability, known as UPNP. In this case, you will need to determine your printer's IP address, then enter it into GrabCAD Print. Open Catalyst or Control Center. Hit "Manage 3D printers" (Catalyst) or "Manage FDM Systems" (Control Center). Highlight the desired printer and hit "Edit". Write down the IP address shown. Open the Printer panel. Click "Add" at the top of the panel. Enter the IP address in the text box and click "Add". If your normal workflow consists of carrying the CMB file to the printer on a thumb drive, you can still use GrabCAD Print to achieve this! Next step: Take a quick tour or Start printing!